Gardiners Quarry is one of many aggregates quarries that can be found across the Malvern Hills. Found on the western side of the hills, it is a small quarry; 30m across and 15m high. The quarry is used as a Malvern Hills Conservators car park, as it one of the main points of access to the hills above. 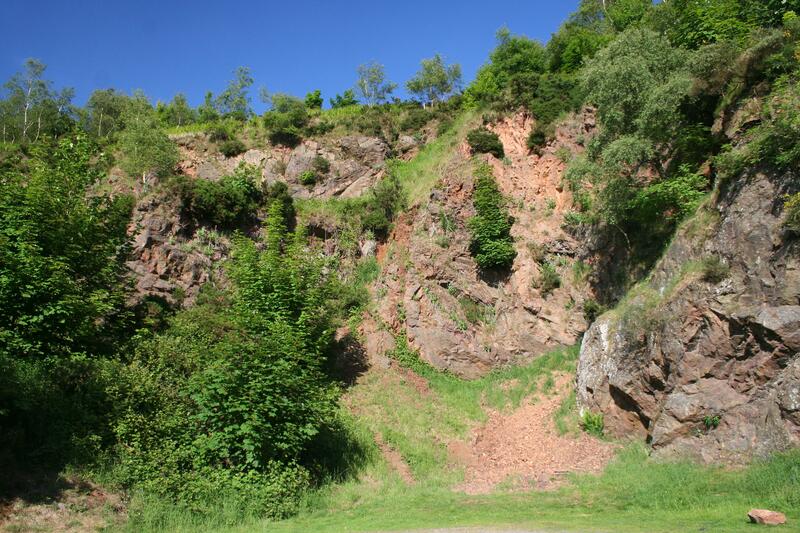 The geology of Gardiners Quarry dates to the Precambrian, approximately 680 million years ago, which means the rocks are some of the oldest exposed in England. The clear quarry face enables amateurs and experts to study the complex nature of the igneous and metamorphic geology on display. From the quarry, the landscape of Herefordshire can be viewed, with the prominent ridges made of Silurian aged limestones running parallel to the Malvern Hills. Beyond these ridges the Woolhope Dome and Shucknall Inlier can be identified, with the flat Herefordshire plain in the distance. On days where the visibility is high, the Black Mountains of the Welsh Borderlands can be seen. 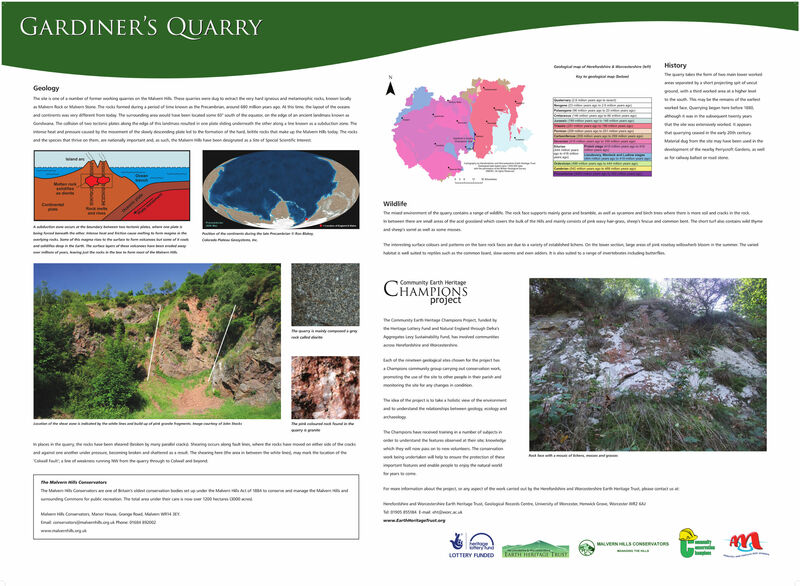 An interpretation panel was produced for Gardiner’s Quarry. Click here to see the panel: Gardiner’s Quarry Panel. 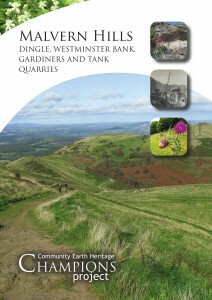 This 52 page booklet takes you on a figure of eight trail 13km (8.2 miles) long and links four Champions Sites; Gardiners Quarry, Dingle Quarry, Westminster Bank Quarry and Tank Quarry. In addition to the detailed descriptions of the fascinating and variable geology seen on the Hills, the booklet also describes the biological and historical features seen at each site. The trail can also be walked as a linear 6.5km (4.18 mile) route. 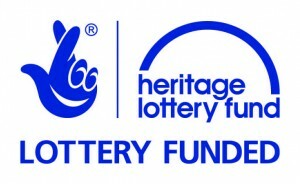 Copies of the booklet cost £3.00 each, and can be obtained from the Earth Heritage Trust. 677 Ma: Crystallisation of igneous rocks (Malverns Complex) from molten rock (magma) at depth. 566 Ma: Eruption of lavas and volcanic ash (Broad Down, south-east of Herefordshire Beacon. 530 Ma: Emergence of deep-seated Malverns Complex rocks at surface. 440 Ma: Submergence of Malverns Complex below the Silurian sea. 300 – 310 Ma: Malverns Complex pushed up towards the surface along thrust faults to form mountains. 210 – 250 Ma: Subsidence of the Worcester Basin along major normal faults forming basis for the present landscape. 65 – 99 Ma: Submergence of Britain below Cretaceous sea. 65 Ma to present day: Emergence of Britain with weathering and erosion producing the main elements of the landscape we see today. 450,000 years ago: Anglian Ice Age with a major ice sheet, 300 – 400 m thick, occupying the Severn Valley.